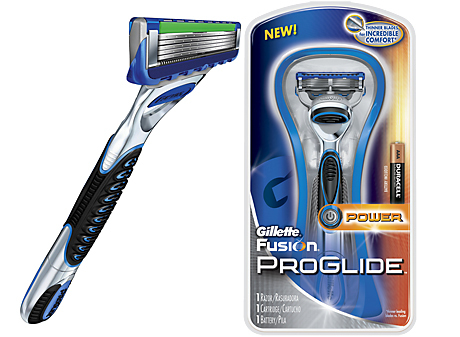 Last year, we partnered with Gillette to give away a number of Fusion ProGlide razors before they even hit store shelves. And now, we’re doing it once again – Only this time, it’s so you can take the ProGlide Challenge. The ProGlide Challenge is the ultimate face-off between your current razor and the ProGlide. Click on the widget below, punch in your info, and they’ll send you a free razor. Then you can see if the new “Snowplow Comfort Guard” that stretches your skin and plows away excess shave cream to keep the blade on your skin, “Microcomb” that guides whiskers into the blades, thinner blades for less tug and pull, Blade Stabilizer to keep the 5 blades at “optimal spacing for comfort,” and thicker, longer lasting lubricating strip, beat out whatever blade you’re currently using. Let Gillette know what you think about the Challenge – Share your thoughts on Twitter using #ProGlideChallenge or @Gillette, or leave a comment on their Facebook page. Offer good while supplies last, so don’t delay! I love Gillette. It gives me the smoothest shave! Super product! !Gives me a smooth and clean shave. It gives me the smoothest shave! I love Gillette. Would love to try it out! This would be an awesome Father’s Day gift for my Dad!! Would love to have him try it out!! Would love to challenge my current razor! I love these razors and I also I love FREE! I can’t wait to put this to the test. Trying new things is always exciting! Would love to have this. for me, for me! yea!! I would love to get the Gillette Razor! THANK YOU FOR SENDING MY HUSABAND HIS FREE GILLETTE CHALLENGE RAZOR. HE WAS SUPRISED YOUR COMPANY EVEN DID THIS FOR US. HE IS SO A CUSTOMER THUMBS UP FOR THIS PROMOTION NEED MORE LIKE THIS.